For thousands of years Tuareg tribespeople have defied the pull of civilisation and roamed the vast and inhospitable Sahara desert with their animals. Yet now the drought that has left seven million people in Niger needing food aid is blighting Tuareg nomads too. With water holes drying up and animals dying many Tuaregs are turning their backs on the desert and heading for cities in the region, perhaps never to return. On the outskirts of Niger's capital city, Niamey, a sprawling tent made out of colourful cloth, old aid sacks and strips of plastic covers a large patch of dusty ground. It's home to a group of 17 Tuareg tribespeople, all of whom have fled here from the scorching Sahara desert to the north. Their leader, Youseff al-Hamada, says their former home has always been a tough and challenging place to live but is now becoming uninhabitable following the ongoing drought. "Life in the desert had slowly become harder and more uncertain than ever," he told me. "And this had affected my people's lifestyle there. As time went by the exodus grew. More and more animals were dying and my own community began to run out of meat and milk. We, too, couldn't sustain our way of life any longer." Youseff told me that until now the annual wet season has brought enough rain to provide some desert water holes and scrub for animals to live off. This, he says is no longer the case in many areas. Faced with having to feed seven children, five of whom belonged to his brother who died of malaria, Youseff followed many other Tuaregs in fleeing to Niger's capital, Niamey. When he and his family first set foot in the city they were appalled by what they saw. "I didn't know how to find anyone, no one spoke my language and I'd never seen so many people together," he explained. "I found having so many people around made me feel very irritated. Then there was the smells. You can see the pipes and the ditches where all the rubbish and human waste goes and it was awful. I was used to standing on a mountain with fresh air on my face but here in the city it always smells bad." Many residents of Niamey have taken an equally dim view of Tuaregs like Youseff flocking to their city. These desert nomads are alleged to be linked with robbery, drug running, violent rebellion and, even more recently, terrorist groups like al-Qaeda. Youseff accepts that his people sometimes keep slaves and have been involved in frequent battles and rebellions but adds that they only ever fight when there is a just reason. And he denies another claim, that Tuaregs are lazy, insisting that the reason they often do not work is because his people lack the skills and education needed. He admits that life in Niamey has been struggle since he arrived and that he still finds it hard to get the money to feed and clothe his children. He also worries his people are in danger of losing touch with unique and long established culture. "If the droughts continue the Toureg people will be forced to change our lives, we will be forced to leave the communities where we live," he says. "This will lead to us losing our language. If these droughts continue I have no doubt that our whole way of life will change." But Youseff's 13 year-old son, El Kassim, no longer seems to share his father's love of the desert. "I think I would like to stay in the city now," he says. "Here there is everything we need. "There are schools, there is access to training and there are pharmacies where we can get medicines. All of this is here but not in the desert." Youseff listens glumly to the words of his son, perhaps the voice of the new generation. I ask him if he fears that El Kassim's views, along with the continuing drought, could spell the end for his people's way of life in the desert? "That's exactly what that is. We're seeing more and more people move into the cities and the young people are changing their behaviour and their point of view on life. 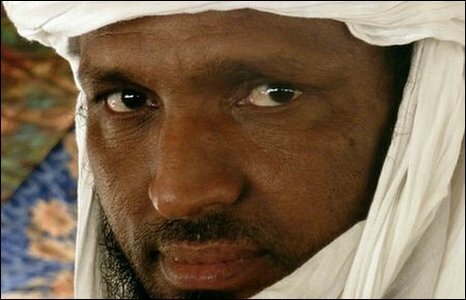 We're seeing the beginning of the end of the Tuareg way of life."